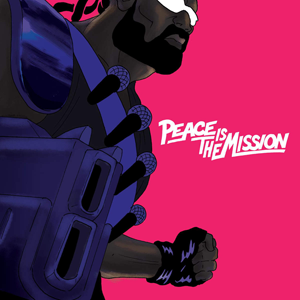 Peace Is the Mission is the third studio album by Diplo's dancehall project Major Lazer. It was released on June 1, 2015.The album was preceded by the international hit single "Lean On" featuring DJ Snake and MØ. The single reached number one in Australia, Belgium, Denmark, Finland and the Netherlands and peaked within the top ten in an additional fourteen countries including the United Kingdom and Germany. Four promotional singles were released; "Roll the Bass" on March 23, 2015, "Night Riders", a collaboration with Travi$ Scott, 2 Chainz, Pusha T and Mad Cobra, released on April 20, 2015, and "Too Original", a collaboration with Elliphant and Jovi Rockwell, released on May 11, 2015. On 2 June 2015, a lyric video was released for "Be Together", a collaboration with Wild Belle, making it the fourth promotional single. On 4 June 2015, a lyric video was released for "Blaze Up the Fire", a collaboration with Chronixx, making it the fifth promotional single.